High Quality Content by WIKIPEDIA articles! 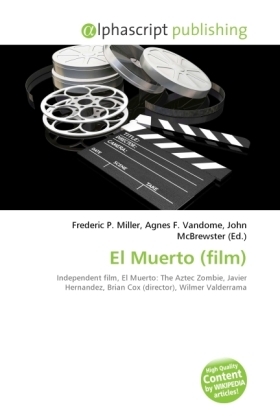 El Muerto (alternatively, The Dead One, El Muerto: The Dead One, The Dead One: El Muerto, The Dead One: An American Legend) is a live-action independent film adaptation of the comic book series, El Muerto: The Aztec Zombie created by Javier Hernandez. The film was written and directed by Brian Cox with Javier Hernandez serving as Associate-Producer. It stars Wilmer Valderrama, Angie Cepeda, Joel David Moore, Billy Drago, Tony Plana, Michael Parks, Maria Conchita Alonso and Tony Amendola. The film follows the story of Diego de la Muerte, a 21-year-old Mexican-American who is abducted, sacrificed, and sent back to the land of the living by the Aztec gods of death and destiny to fulfill an ancient prophecy. The official premiere was held on March 1, 2007 at the Latino Film Festival in San Diego, California with a straight-to-DVD release slated for September 18, 2007 followed by subsequent screenings in New York and San Diego. The official site address (www.elmuertomovie.com) has since been re-directed to a MySpace film account.